for $775,000 with 5 bedrooms and 1 full bath, 2 three quarter baths. 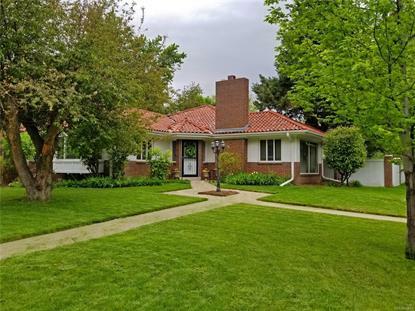 This 2,790 square foot home was built in 1951 on a lot size of 0.22 Acre(s). An exceptional home on the coveted 17th Avenue Parkway in Parkhill. This is a 2790 total sqft, custom ranch, on one of the most iconic tree-lined streets in Denver. A warm & inviting, 5-bed/3-bath, modern inspired home, filled with character on a large mature lot. Impeccably maintained with timeless, high-end finishes. The moment you enter, you feel a tranquil energy and know that you are in a rare property. Enjoy the newly updated kitchen with high-end stainless appliances, solid granite counters & premium cabinetry. Relax in the luxury of the updated baths with spa-inspired finishes. Experience the quality & beauty of real hardwood floors. Melt your cares away in front of a fire in the stunning living room. Sleep deeply in the calming master suite with en-suite bath. You will always be comfortable with energy efficient windows, newer furnace and central air. Private fenced back yard, 2-car garage, in-ground sprinkler & close to best shopping & entertainment that Denver has to offer!